I once thought Polymer Clay wasn't a medium for real jewelry designers. It was for stay-at-home moms who wanted a material they could play around with, to make a cute little ladybug charm or whatever, and throw it in their kitchen oven to bake. A few projects to break the monotony of being at home all the time, that would give them something to talk about and show to their friends. Boy, have I proved myself wrong! I have seen beads and jewelry that I NEVER would have dreamed could be made using polymer clay. Today I discovered sugar beads, and I found two methods of making them – one using teeny tiny micro beads, and the other using frit. Both begin as a polymer clay bead that is then rolled in the beads or the frit. Both are beautiful, but I like the micro bead version because it gives a more uniform shape. 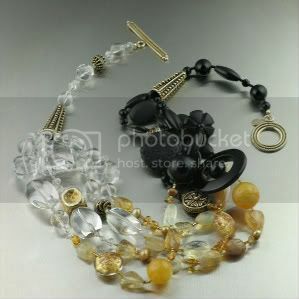 These are the modern version of vintage beads that were made of glass or Lucite. Each bead is formed first from polymer clay, then baked at 275 degrees for about 25 minutes. The sugar is then applied, and the bead is baked again. The last step is two coats of water-based polyurethane to give extra strength and a glossy shine. I love the texture. Sugar bead are easy to make and can add a little pizzazz to an otherwise plain spacer bead. You simply roll the bead in the frit or micro beads when it is hot enough to pick up the coating but not so hot it loses its shape. Then put the bead into the cooler of the flame to make sure all the bits are firmly in place. Sugar beads were originated in Japan in early 1900s. They were coated with small grains of plastic or glass that looks like granulated sugar. Vintage sugar beads were very popular during the 1950s. After WWII, labor in Japan was cheap, and the Japanese produced inexpensive jewelry in large quantities, but it wasn't well regarded. The artisans in Japan, as impoverished as they were at the time, were also highly talented. They also used lampwork beads, hand-painted art glass and plastic beads, and acrylics with foil and aurora borealis coatings in their jewelry. The fabulous color and shape combinations are now being valued. The polymer clay beads are a pretty good representation of vintage glass beads, I'd say. And they're certainly less fragile. 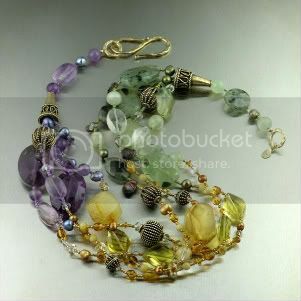 This vintage necklace is a fun combo of sugar beads, celluloid chain, and leaves. The chain is attached to black satin twisted cording. The necklace has no clasp closure, but instead is tied on. A Bead's Life on the Glasscapes website is a complete explanation of how glass canes are made, including pictures. I have attempted to give a shorter description of the process below the images, if you're interested. If not, just enjoy the beautiful images of the beads and cabochons that are then made with the glass canes created by Mingo and Asho. The crystal glass furnace holds large quantities of crystal glass. Once fired, it remains hot while molten glass is present inside. It's very hot and noisy. The raw crystal glass, which is like fine white sand when cold, is placed in a crucible inside the furnace, which is surrounded by a blown oxygenated propane flame. After heating, the sand-like particles become molten crystal clear glass, something like smooth lava. The glass artist works the edge between the liquid and solid state where mental images magically transform into physical reality. The glory hole is a blast furnace used by glass blowers to maintain the temperature of the piece they're working on. It can also be used to melt smaller pieces of glass that are used in small quantities (i.e. the colored glass used for beads) or to warm up a larger work in progress. The glass artist inserts the work in progress through the hole, and holds it in the extreme temperatures for the time necessary to provide the desired amount of workability required for the glass object under construction. The blow pipe is a device used by the glass artist to create an air pocket inside the molten glass, as well as a tool to balance the molten globule of glass on. The application of molten glass to the end of the blow pipe allows the glass blower to start the process. The liquid crystal glass being applied to the working end of the blow pipe will become the glue used to attach other warm but still solid glass piece to the end of the blow pipe. The liquid crystal glass being applied to the working end of the blow pipe will become the "glue" used to attach other warm but still solid glass piece to the end of the blow pipe. Once the glass has been heated to its liquid state and worked for perfect centering, the glass is dipped into the liquid crystal glass from the furnace. Mingo rotates the molten glass globule until it is the proper shape and ready for blowing. When ready, Asho blows into the far end of the blow pipe. The air pocket created inside the piece must be just the right size in order to produce a hole that becomes the center in every bead. Too much and the hole is huge, too little and the hole is too small. This is truly an art that requires knowledge, experience, and intuition in order to get it just right. Various colors are prepared and applied to the molten glass globule that is to become the exquisite beads Mingo and Asho are world famous for producing. The piece is blown, then dipped in the crystal glass several times in order to create the desired effect. The marver table is essentially a large steel plate that is very clean and smooth. The table is located fairly close to the glory hole and is used to work the molten glass as it is heated, shaped, cooled, and reheated. The colors are then applied and worked into the piece on the marver table. Sparkles and/or dichroic glass may be added to the molten globule. The glowing globule of glass dangling from the blow pipe is then stretched and cut into canes, thin multicolor rods of glass that are cut into workable size pieces. The bead canes are then placed into the annealing chamber, which is a large well-insulated chest that can slowly increase or lower the temperature of objects placed inside. The chest is necessary to protect the glass objects and to prevent breakage from the stress of rapid temperature changes. This whole process is repeated three or four times, until all the glass has been removed from the blow pipe. One of the more astonishing aspects is that nobody knows exactly what the beads will end up looking like until the very end after the cane has cooled sufficiently for the colors in the glass to emerge. I was doing some research for a post I'm writing about Lampwork Beads when I found this website, and I soon discovered that it's about so much more than just lampwork beads. Andrew Roberts at Glass Rave has been working with borosilicate glass for more than a decade now. This glass is distinguished by high refractive and transparency properties and superior durability. Andrew uses various borosilicate glass mineral colors as well as fusing 24k gold and sterling silver overlay fumes to give unique appearance and appeal to his pieces. He then kiln fires the finished pieces for up to 15 hours for maximum strength and durability. This hand blown glass pendant features multi green colored frit imploded and nicely spiraled. Borosilicate glass was developed originally for cookware (trade name PYREX) and scientific glassware such as test tubes. This makes borosilicate glass much more durable than soft glass (soda lime) which is used to make most glass beads, art glass vases, ornaments and paperweights. The durability of borosilicate glass makes it a great product to use for glass beads. This hand blown glass pendant features a blue and pink color scheme in a raked swirl pattern. This piece was worked at high temperatures and pulled into shape. Comes with a colored loop. Andrew developed an early fascination to the form, learning as a child that glass is a liquid and formable when heated to higher temperatures. His introduction to lampworking (torch glassblowing) came naturally in 1996 in Boulder, Colorado, where a small growing number of lamp workers were gathering. He is thankful for the opportunity to make things of value for people who appreciate artistry and glass work. Andrew creates out of inspiration gathered from both the solitary pace of nature and opportunities presented in modern life. He believes his true glass purpose will come in the future, that he is just beginning to create out of sole artistic inspiration, his technical skills adding from every torch experience. Andrew Roberts has been working boro glass on and off since 1997, with a little soft glass thrown in. He currently works from a studio in Southern Minnesota. This hand blown glass pendant features handmade color cane laid into the piece hot in ring patterns, creating a unique look and appeal. This piece was worked hot at high temperatures and melted into a round optic. The individually created blown glass pendants and focal glass jewelry pieces for sale here are made out of durable borosilicate glass. Some of the ingredients used for our hand blown glass jewelry and lampwork pendants are .999 pure silver and pure gold and colored borosilicate glass. All glass items have been properly annealed in a digitally controlled kiln for maximum hardness. What is lampworking? Lampworking is a type of glass work that involves using a torch as a heat source to melt, work and shape the glass as opposed to hot glass blowing or furnace glass work which uses a furnace to keep liquid pooled glass hot. Lampworking is also referred to as torch work. What kind of stuff do you make the designs in the glass out of? Designs in glass are usually made from small layers of gold or silver or colored glass, which is made from regular glass and metals and additives. But sometimes we put other materials inside like sulfide or meteor glass. How do you make all those designs? By hand or with a machine? Yes. By hand, it takes some imagination. You've got a substance that can flow like honey, can become sticky or brittle, you can condense and twist and pull and add and shape. Think 3 Dimensionally on a hollow ball, and how that shape could be condensed into a thicker solid form. Do you really blow the glass? Yes, when we work with a tube of glass we condense and expand the glass, which we do by using gravity and blowing of air. When we blow air into a hollow closed off ball of glass, the air pressure forces the glass ball to expand. Watch the Twisted Cane Glass Video Tutorialor read the Dot Implosion Tutorial for a visual explanation of how Andrew does his work. Mary Harding works mostly with earthenware and low-fire clay. She likes the way the clay expresses itself even after multiple firings. There is always that element of the unexpected. Mary's work expresses the subtle undercurrents and eddies stirred by her lifelong interest in contemporary masters such as John Cage, Freda Kahlo, and Marguerite Duras. Mary's recent work involves gathering the timeless and enduring plants of the pastures of Northern New York and channeling these plants to create ceramic pendants, marks a fresh and imaginatively interpreted fusion of styles and material embodied in her colorful renderings of these resilient beauties. This earthenware ceramic pendant measures 1 1/4 inch in diameter. It is mason-stained and hand-painted. It has been fired multiple times at my studio in a digitally-controlled ceramic kiln. Mary designs and individually creates all of her ceramic pendants, and each one is a unique work of art. Careful attention to the nuances of her work reveals the cross-current created by her fascination with folk artists, and her search to find and celebrate their work in both Northern New York and Mexico. Each pendant marks its own creative journey as each work is individually hand-painted by the artist, fired, inspected, and then creatively finished to bring out the fusion of contemporary and folk art drawn from the qualities of the clay, the form of the pressed plant, and the glaze that brings the impression to life. This fused glass pendant in shades of blue and aqua looks like an underwater scene and is complete with some lovely tiny bubbles. Pendant measures 1 3/4 inches in length and 3/4 inches wide. It comes with a cold fused Sterling Silver Plate bail that is large enough for most chains and cords. 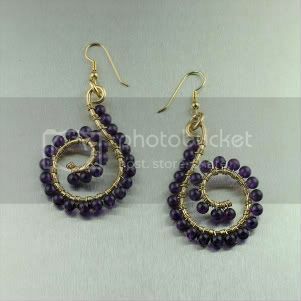 Can be worn solo or as part of your beaded creation.